How Far is S&S Green Grace? 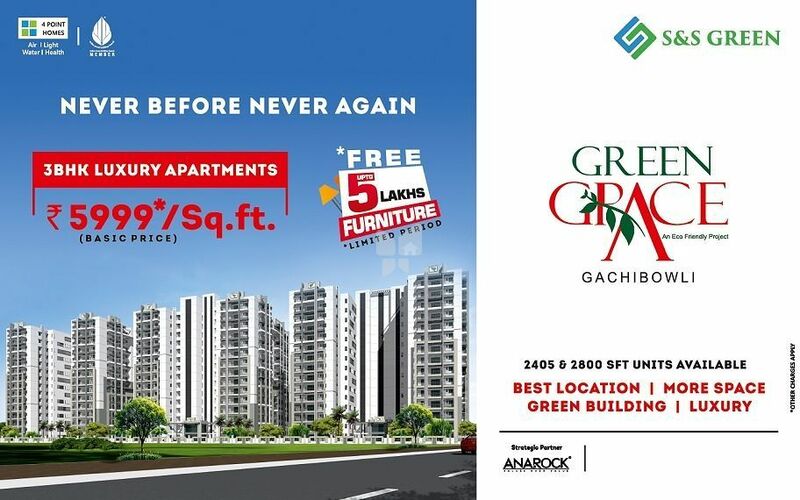 Green Grace is 3BHK Luxury Apartment Project, spread on a total area of 5.38 acres at Gachibowli, next to Oakridge International School. 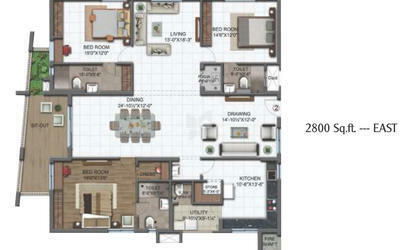 There are 420 apartments in 3 blocks, all of 3BHK and sizes available are 2405 and 2800sft. Block A and Block C consisting of ground +14 floors totalling to 150 flats in each block. Block B has120 flats with ground +14 floors. For each flat, 2 covered car parks are on offer at present. Each apartment has 10×12 spacious sit out. This project comes with additional features like solar heated water, sewage treatment plant, LED lights, low VOC Paints, 300ft deep rain water percolation system, mini urban forest and use of quality material & equipment as per IGBC standards. Also, 29000sft ready to use club house with high-end luxury amenities such as roof top swimming pool, roof top party lawns, mini theatre, Gym, indoor games, spa, yoga hall, tuition room, Library, doctor room, Physio therapy, Party hall, cafeteria, super market & guest rooms etc., are provided. 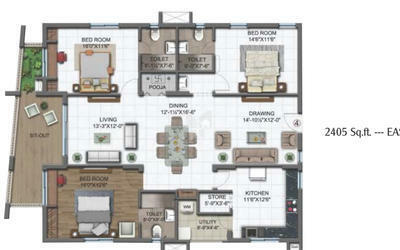 Situated in prime location in Gachibowli, close to ORR, opposite to Ramanaidu Studios, walkable distance from Delhi Public School, Future Kids, Jubilee Public school, Chirec etc., 10 minutes drive to the major IT Giants like Wipro, Infosys, Franklin Tempelton, etc… close to financial district, 20 minutes drive from the International Airport, 5KM to major hospitals such as Continental, Sunshine, Care, KIMS. Inorbit mall & IKEA Home furnishing are near by and 15 minutes to Jubilee Hills and Banjara Hills. Plug points for TV & Audio systems etc. "A 15 Year old company, S&S Green Projects follows a basic 4 Point Standard - the quality of air, use of natural light, conservation of water and good health, which is committed to sustainability and builds green residential buildings. This standard is adhered to in all its projects. In addition to creating architectural masterworks, the Company takes meticulous care in ensuring that the projects have perfect Vaasthu, utility, a clear title so as to give the customers a hassle-free ownership. An intensely customer focused Company that guarantees a quality product that will last generations - S&S Green Projects." They also aim to build homes which make living healthier and happier. This is one of the main reasons why every home that they construct, conforms to the basic 4-Point standard – the quality of air, use of natural light, water conservation and good health. Apart from helping their customers save over 40 percent on electricity and water, 4-Point Homes makes their lives healthier by almost 20 percent.